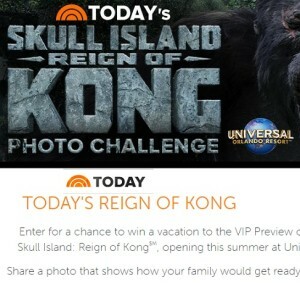 Enter the Today’s Reign of Kong Photo Challenge and win a vacation to Universal Orlando Resort! 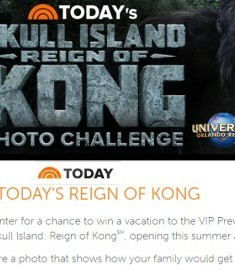 You could win a vacation to the VIP preview of the colossal new ride Skull Island: Reign of Kong. It opens this summer at Universal Orlando Resort, be there to see the monumental opening. Share a photo that shows how your family would get ready for this daring adventure. The judging is as follows: Originality (50%) and Creativity (50%). There are 10 Grand prize winners! 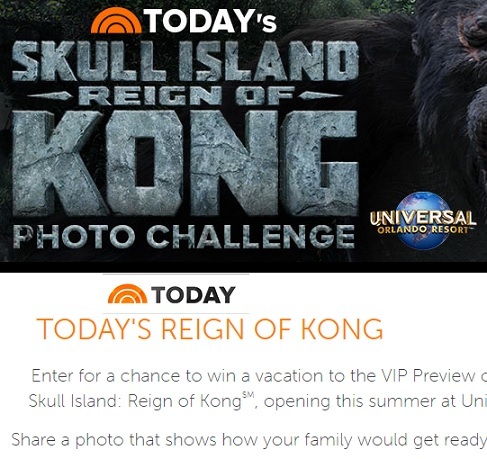 Each grand prize winner will get a vacation for 4 days and 3 nights for 4 to Universal Orlando Resort in Orlando, FL to experience Universal Orlando’s Skull Island: Reign of Kong VIP Preview Event on or about June 23rd, 2016. Each Prize will include airfare, 3 nights standard hotel accommodations at Universal’s Cabana Bay Beach Resort, ground transportation, 3-Park Unlimited Passes for admission to Universal Studios Florida, Universal’s Islands of Adventure and Wet ‘n Wild Orlando, admission to one Blue Man Group performance and attendance at the VIP Preview Event. The Approximate Retail Value of each Grand Prize is $3,424.50. Enter this awesome win a trip sweepstakes today!